With this posting, we’ll begin a discussion about leadscrew/ball screw/linear slide systems. Picture a screw with a nut on it. No, no not a Walnut. Sighhhh. OK then, picture a right-hand threaded 1/4-20 screw with a 1/4-20 nut threaded on to the screw. A 1/4-20 screw has an outside diameter or major diameter of 0.25” and the thread of the screw has 20 turns per inch. Thus, the name is a 1/4-20 screw. The valleys of the threads are cut into the screw’s shank and are referred to as the root diameter or the minor diameter. Orient it so that you are looking at the head of the screw and the thread portion is pointing away from you. 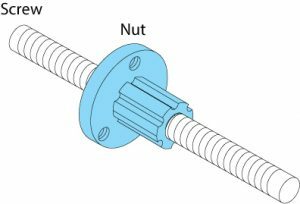 Hold the nut with one hand so it won’t spin and turn the head of the screw clockwise (CW) with your other hand. No, it doesn’t matter if you hold the nut with your right or left hand. What happens? The screw moves toward the nut or the nut moves toward the head of the screw. (Do you remember righty-tighty?) Now rotate the screw counterclockwise (CCW). What happens? The nut moves away from the head of the screw. (How about lefty-loosey?) 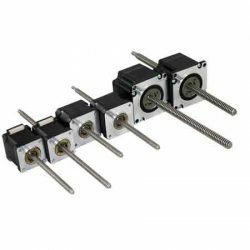 We just created another rotary-to-linear motion converter. Let’s get even more creative by attaching a flat plate to the nut. Now, when the screw is rotated, the flat plate/nut moves back and forth. Let’s try to make it even more useable. Let’s mount the screw in an assembly that has a bearing/restraining support for the screw that prevents it from moving in a linear fashion. We’ll also have the screw’s headline up with the shaft of a stepper motor. We’ll add a mounting bracket for the motor so that the motor’s shaft and the screw’s shaft stay lined up. Remove the screw’s head and add an appropriately sized coupling to connect the two shafts together. Install ball bearing rails on both sides of our flat plate. These bearings will now prevent the nut from turning (Yes, you can let go of the nut) and provide a low friction mechanism for the flat plate to slid on. The flat plate moves toward the motor when the stepper motor’s shaft rotates CW (as seen from the back of the motor). When the motor’s shaft rotates CCW the flat plate moves away from the motor. Google “motorized linear slides” and you’ll find out we didn’t just invent a new rotary-to-linear converter, so don’t file for your patent. We can still embellish our design by replacing our 1/4-20 nut with a ball nut. (For more info Google “ball nut”.) We can increase the diameter of the screw so it can transmit higher forces. We can have different screw lengths which will provide for different stroke lengths. We can have different threads per inch which can produce fast or slow motion or fine or coarse motion. For example, a two-pitch ball screw (two revolutions per inch) will move faster linearly for a fixed motor speed than a five-pitch ball screw (five revolutions per inch) spinning at the same speed. However, a five-pitch ball screw would have finer positioning capabilities than the two pitch one. Using a stepper motor in the full step mode (200 steps per revolution) with a five-pitch screw produces 1,000 steps per inch while the two pitch screw would produce only 400 steps per inch. Thus, there’s a tradeoff between speed and positional resolution. In addition to “English” screws, we can have metric threads of various turns per centimeter too. More about ball screws and linear slides next time.